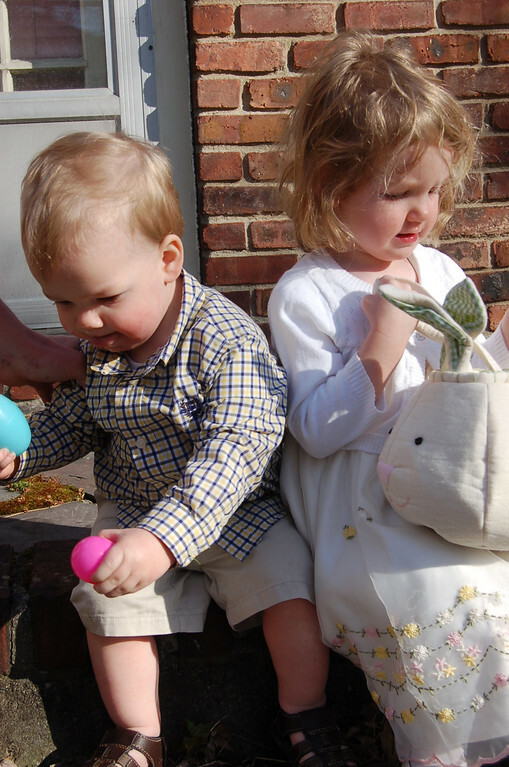 Ask the Mamas: Easter Traditions Mama Say What?! | Mama Say What?! Every year we go to church and exchange Easter baskets, but other than that we do not have any set traditions yet. Last year Elizabeth was four months old and after church we grabbed some lunch-to-go and went to the beach for a picnic. That was a great time, but more for my husband and me. This year we will go do something fun for Elizabeth, such as the zoo or a park after church. As Elizabeth gets older, we will also start explaining the importance of the holiday and what it means to our family. ~Michelle W.
Given that neither my husband nor I observe the religious side of Easter, we have yet to establish any traditions for our son. Last year (when he was three) was the first time we did an Easter egg hunt in our house. This year, I’ll very possibly have a newborn right around Easter, so we have no set plans thus far. Within my family, we always had an Easter basket full of goodies waiting for us from the Easter Bunny when we woke up in the morning. Then we’d all pile into the minivan and drive to a local park to meet up with my grandparents, aunts, uncles and cousins. We’d cook a big breakfast on camp stoves and build a campfire. We’d play games, have an egg hunt, go hiking and pretty much spend the whole day at this big park enjoying the outdoors. Since we don’t currently live in the same state as my family, we can’t participate in that tradition anymore. 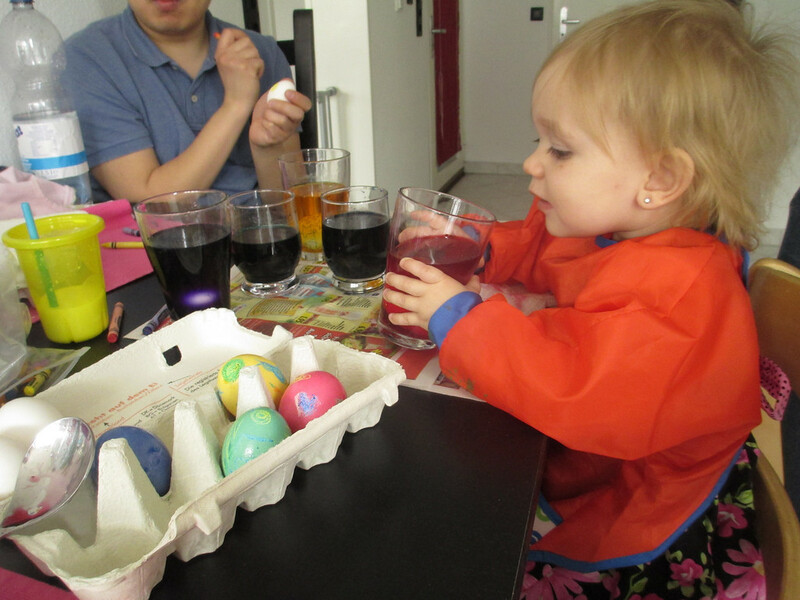 But we hope to move back soon and start it up again so both of my kids can grow up with this fun tradition. ~Alex T.
We also don’t celebrate the religious side of Easter. Anna gets a basket of goodies which generally don’t include candy. Last year it was books, robes, slippers, useful stuff. She will likely get a sweet treat this year though because she is older. 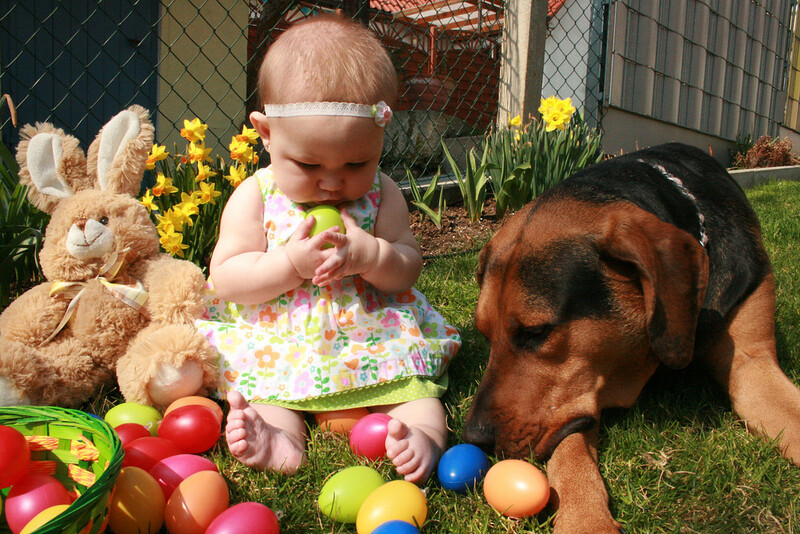 I also plan to have an Easter egg hunt outside if weather permits. Usually her Gramma and Poppa will come over for dinner too. ~Jessica S.
We are attending a new church this year that we all love, so I’m sure Easter will have some new meaning for us. Typically, we attend church and then spend the rest of the day at my in-laws house with some family. We have a big dinner and the little kids go on an egg hunt in the backyard. Last year, B didn’t really understand it, but this year he might. ~Mary Ellen M.
For us, Easter is all about Jesus. We don’t do an Easter egg hunt or baskets, but we do have a big meal to celebrate together, and I like to make Italian Easter Bread. As our children get older and can understand more, I’m hoping we’ll develop some traditions that are really meaningful and help them to understand why we’re setting this particular Sunday apart. ~Christina D.
We will attend our church service and we will explain to our children the importance of Easter as a celebration of Jesus. We will of course also do the Easter bunny thing. We’ll dye eggs and do an Easter egg hunt, maybe give each kid a small basket with a couple little treats. Where we live in Germany, kids get Easter presents, similarly to Christmas on a smaller scale, so we’ll get our kids probably a bigger present for them to share. And of course, we’ll do lots of Easter bunny crafts! ~Cassie W.
If any mamas are looking for some non-candy Easter basket ideas for their little ones, check out these posts! Baskets for the Little Gentlemen and Baskets for the Little Ladies! Added by Michelle W. on April 15, 2014.